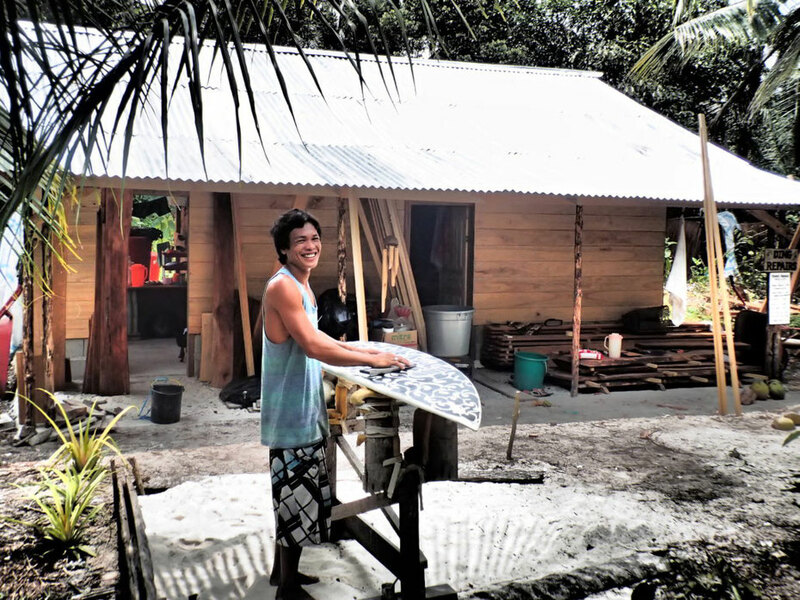 In response to Rip Curl’s ding repair workshop in the summer of 2013, local surfer, Imer, has created his own business in which he repairs boards for traveling surfers and locals alike. Imer repaired twenty boards last season, and is continually learning new techniques with each repair. The tourists are thrilled to have an experienced local in the village to ease the pain of breaks and dings to their wave riding vessels. When asked how he feels about his new line of work, Imer grinned and said he is stoked for the opportunity to interact with tourists and feel he is helping them. There is now a sign on the beach in Katiet notifying tourists in the direction of Imer’s Ding Repair Shop. Imer is pleased to have tourists staying here, stating he enjoys meeting them and is excited to have created a business in response to their presence at his home break. From our perspective, it’s a marvel to see the local community embracing the changes that are taking place in their area. The enthusiasm, openness and grace with with which they meet these challenges are a lesson to us all. And above all, it is enabling them to stay on their land and share their culture, rather than be displaced by outsiders.